Medical Media Images Blog: What is a Heel Spur? Heel Spurs are bone spurs which form on our heel bone called "calcaneus". Many other structures in our foot and ankle attach to our heel bone (muscle tendons, ligaments, fascia). Heel spurs usually form at these attachment points due to chronic inflammation from overuse. This inflammation eventually causes a bone spur to form. A common reason for heel spurs is "plantar fasciitis". The plantar fascia is tissue on the bottom of our foot which runs from the heel bone all the way to the balls of our foot. When this tissue become inflamed (plantar fasciitis), it can cause heel spurs where it attaches to the heel bone. Who has a higher risk to develop Heel Spurs? 4. Wearing shoes without a good arch support. What Symptoms do Heel Spurs cause? Most patients experience pain and tenderness with walking, or just putting pressure on the heel. The pain is often described as a sharp "knife" or "needle" like sensation in the heel when first getting out of bed. Later in the day, the pain become more of a dull ache. The pain often gets worse with jogging or running. Walking barefoot on a hard surface can also be uncomfortable. Some patients can feel pain in other areas of the foot as well. This is due to inflammation which spreads from the heel to elsewhere in the foot. How are Heel Spurs diagnosed? A patient history of having pain and tenderness in the heel is often very suggestive of a heel spur. As the doctor pushed on the heel, you may feel your typical pain. An X-Ray will show bone spurs once they reach a certain size. Here is a Color X-Ray which shows a typical heel spur. This Image is Interactive. Just move your Mouse Cursor over the Image and see the Image Tags come alive. Each tag displays text to explain a specific structure (if the Interactive Tags do not display properly due to slow Browser Speed, just refresh the page). 6 Surgery: This is rarely done. Removing the spur itself may not give you pain relief. Color X-Ray, Color MRI Images and Text like the ones featured in this Blog are available for Licensing for Websites and Publications at www.medicalmediaimages.com. You can also find these and hundreds of other Images on the Navigation Bar at the top of the Blog. 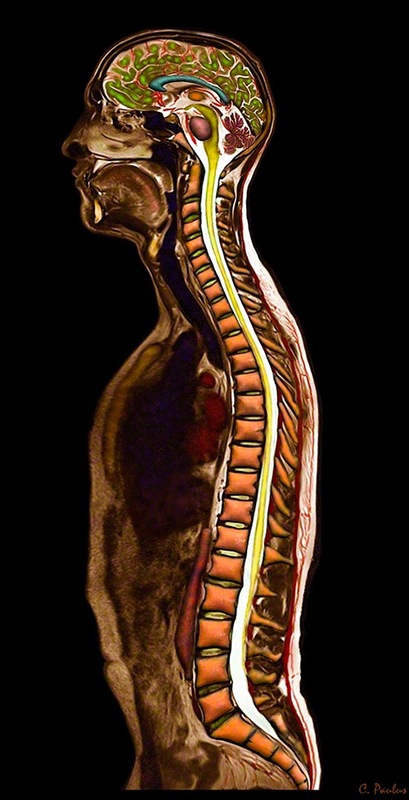 What is "Cervical Spondylotic Myelopathy" (CSM)?